Since September 11, 2001, Canada has consistently been expanding its foreign military and police presence in Central and West Asia under U.S. and NATO command. While openly participating in the invasion of Afghanistan, the Chrétien Liberal government would not openly join the “Coalition of the Willing” and provide more than a handful of troops for the U.S. invasion of Iraq in 2003, despite having provided troops, warships and jets during the previous U.S. invasion of Iraq – the Persian Gulf War. 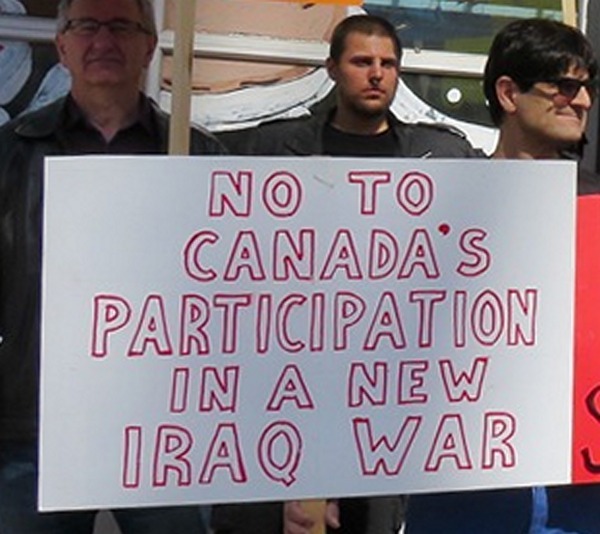 The Trudeau government has now taken up the challenge to provide an air of legitimacy for Canada’s ongoing military actions in Iraq and their expansion. On June 29, the Trudeau government announced that its mission in Iraq would be extended for two more years and that the mission would be “adjusted.” This is a far cry from its election claim that it would end Canada’s combat mission in Iraq, giving the impression that it was against foreign military escalation. Shortly after being elected, the Trudeau government launched a new mission in the Middle East, focusing on Iraq and neighbouring countries such as Jordan and Lebanon. The Canadian Press reports that Canada’s Chief of the Defence Staff Jonathan Vance is being given greater “flexibility” to decide what types of forces to deploy into the region, to a maximum of 850 military personnel. The presence of 200 special forces in Iraq has been publicly announced, as well as Canadian planes that provide refueling and reconnaissance for U.S. bombing raids. Vance’s “flexibility” is actually aimed at meeting U.S. demands rather than being decided by the Canadian government. Flexibility may also mean giving Vance more powers to decide what these forces will do and under whose command. In March he told a House of Commons Committee that Canadian soldiers can shoot to kill if they determine “hostile intent” and then used weasel words to try to make this synonymous with self-defence. Aggressive actions by Canadian soldiers indicate they have already been given approval to shoot whomever they decide and then claim “hostile intent.” Canada is also said to be adding a military transport aircraft to the mission, and estimates the overall cost of the new two-year mission at about $378 million. It is not specified who will use this transport aircraft or what will be transported, however this is no doubt being put at the disposal of the U.S. The CBC reports that Canada’s Foreign Minister Chrystia Freeland has also authorized the expansion of the Canadian policing mission in Iraq. The RCMP-led police force is currently made up of four officers in Iraq and will be ramped up to 20 within the year according to reports. It will be made up of provincial and municipal police officers under RCMP command. To put a progressive veneer over Canada’s escalating involvement in U.S.-led aggression in Iraq, the government claims the emphasis will be on recruiting female officers. Left unsaid once again is that the ultimate authority and control over Canada’s mission is with the U.S.
“We know that Canada can, has and will continue to do important work in our efforts in northern Iraq,” Trudeau said. “Canada has a strong role to play as part of the international coalition against terrorism.” What Trudeau fails to mention is Canadians’ longstanding opposition to participating in a military mission in Iraq at the behest of the United States, which destroyed the country in the first place. Despite the changes, Minister of Defence Harjit Sajjan said the military would continue to operate within the confines of its previous “advise-and-assist” mandate. This mandate has been a fraud as Canadian troops have from the beginning been involved in direct combat, as evidenced by the gloating of Canada’s Prime Minister over the accuracy of Canadian snipers, one of whom is said to have killed someone deemed an ISIS fighter from 3.5 km away. Source: TML Weekly, September 23, 2017 – No. 29. Sightly edited by TS. Second, the article does not deal with Canadian involvement in Kurdistan, which is having a referendum on independence on Monday. This will be subject of a future article.